Out to Lunch is back. The City of Worcester and the Worcester Cultural Coalition announced the eighth installment of the Out to Lunch Summer Concert Series on the Worcester Common Oval. It runs 11 a.m.-2 p.m. Thursdays, from June 22-Aug. 24. 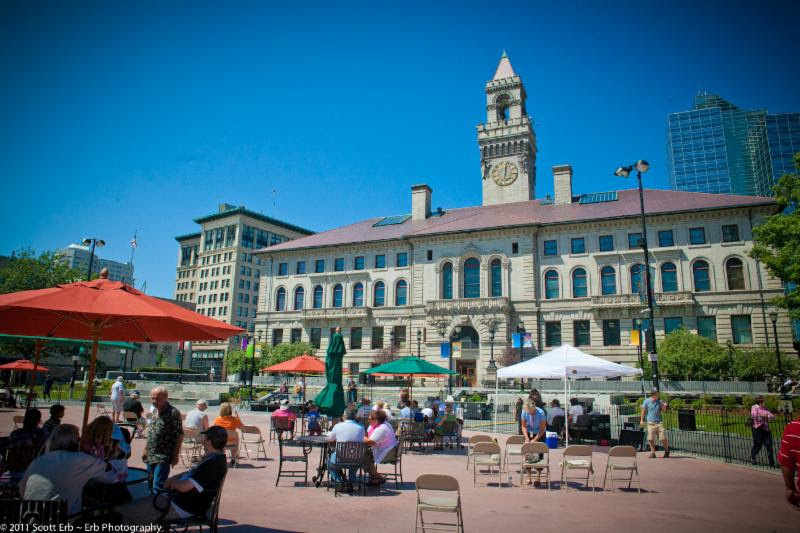 “By using the power of the arts and leveraging Worcester’s creative community, Out to Lunch works as a great example of what creative placemaking can do for our city,” said Cultural Development Officer Erin Williams. The city also announced a Friday Farmer’s Market is coming to the Worcester Common Oval. It will run 11 a.m.-2 p.m. June 2-Sept. 29. K.J. Rawson, assistant professor of English at the College of the Holy Cross, received an American Council of Learned Societies Digital Extension Grant to continue his work on the world’s first Digital Transgender Archive ( DTA), an online collection of transgender-related historical materials, which launched in January 2016. The collaborative repository already contains more than 2,100 digitized primary source historical materials including oral histories, personal papers, organizational records, serials, photographs, and ephemera, all contributed by more than 32 collaborators from six different countries (Canada, Germany, England, Norway, South Africa, and the United States). The site currently gets 3,000 unique visitors per month. Since the site went live, it has had more than 33,000 unique visitors. Jeanne McKeon, Ph.D., and Bruno Miguel da Cruz Godinho, Ph.D., have been awarded Milton Safenowitz Postdoctoral Fellowships by the ALS Association, an honor that includes $100,000 each over two years to support their ongoing research of amyotrophic lateral sclerosis, the progressive neurodegenerative disease that affects nerve cells in the brain and spinal cord. The program is designed to encourage promising young scientists to enter the ALS field and facilitate their research. McKeon and Godinho were two of only six fellows chosen this year. Fellows work with a senior mentor and receive extensive exposure to the ALS research community through meetings and presentations. After completing the fellowship, 90 percent of fellows continue to pursue ALS research. The Worcester County Light Opera Company is accepting registrations for its summer youth musical theater. Performers 7-15 years old are eligible for the workshop, which meets 6:30-8:30 p.m. Tuesdays and Thursdays June 27-Aug. 10, except July 4. Performances of “Seussical Jr.” will be 7 p.m. Friday, Aug. 11 at 2 p.m. Saturday, Aug. 12. Cost is $175. Performers cannot miss more than two sessions and must be available during the week of the production. Shoppers and volunteers recently came together at the Big Y Supermarket on Mayfield Street for the Rachel’s Table Foodraiser food drive to collect over a ton of food to feed hungry people in Worcester. In two hours, shoppers purchased and donated 2,307 pounds of food. In addition, $450 in donations helped buy food and purchase Big Y gift cards, given to families living in hotels. The food was donated to Friendly House Neighborhood Center to be distributed to Worcester food pantries, shelters and soup kitchens. Rachel’s Table is a food rescue organization that collects food from commercial and community agencies, and redistributes it to feed hungry people. In the last 28 years, Rachel’s Table has distributed 12 million pounds of food in Worcester. 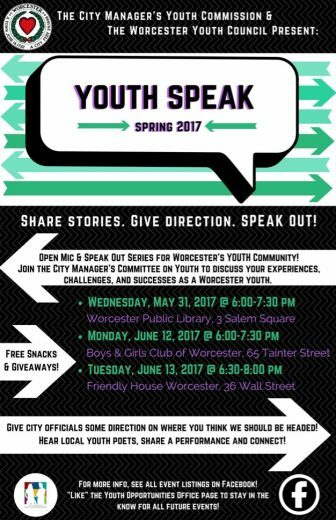 The Worcester Youth Council and the City Manager’s Youth Commission will hold three events as part of its Youth Speak Series. This series of events is designed to have Worcester’s youth showcase their talents and to discuss the challenges and successes the city’s youth experience. Attendees will have the opportunity to sign up for an open-mic slot and to hear a local youth poet featured performer. In addition to the open mic, the event will also be used to get feedback from attendees on their experiences as young people in the city of Worcester. 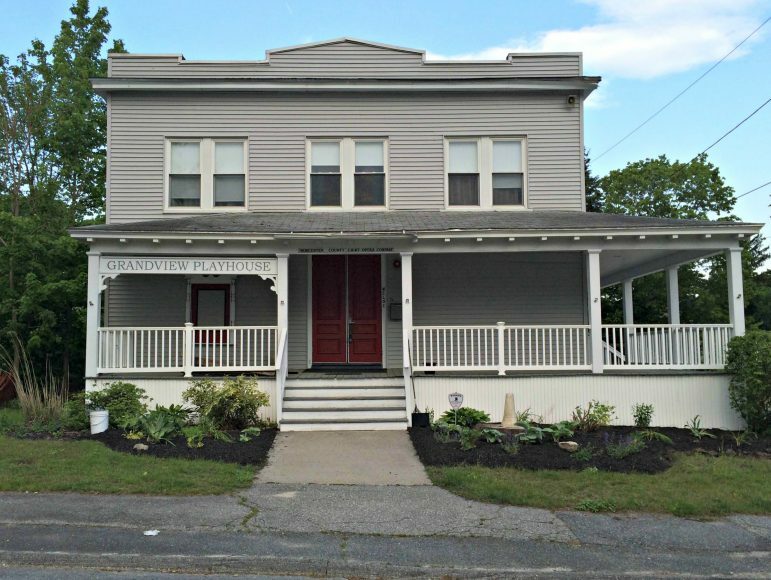 The first event is 6-7:30 p.m. Wednesday, May 31, at Worcester Public Library, 1 Salem Square. Other events are 6-7:30 p.m. Monday, June 12, at Boys and Girls Club of Worcester, 65 Tainter St.; and 6:30-8 p.m. Tuesday, June 13, at Friendly House, 36 Wall St.